Welcome to the Virtual Kaleidoscope Museum. The staff of the Virtual Kaleidoscope Museum wishes you an enjoyable visit. Please take the time to view each floor of the museum. 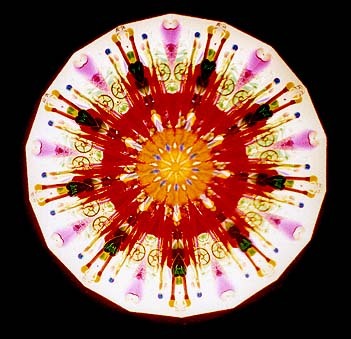 Our collection of kaleidoscopes and related materials is expansive. At this time we are just starting construction of the museum and the galleries of kaleidoscopes. You are welcome to explore the museum during the construction phases. I suspect this project will be ongoing, and some floor or another of the museum will always be under construction. As time allows, more of our collection will be put on public display. Hours of Operation: As this is a virtual museum, we are staying open 24 hours. Rules of Operation: Please be respectful of your other guests and observe our simple rules. 1. No eating in the museum. 3. Enjoy looking at the exhibits, but please no touching. 5. Photography of exhibits is allowed, but please no flash photography. 7. Please visit the sponsors of the museum and purchase their products. Museum Directory: To Go to any floor, click on the floor desired. Thanks for visiting the Virtual Kaleidoscope Museum. This museum is the sole property of the webmaster. It is intended to be a reference source for all kaleidoscope collectors. Please be aware we are discussing a form of art. While I will try to be as objective as possible, any artwork is more a matter of subjective tastes.